It can be hard to find wrapping paper on the road, so we had to improvise. Our travels, however, are just getting started. I lived in Northern Virginia's Loudoun County from 2000 to 2002. It was and still is the fastest-growing county in the nation, due mostly to a cluster of technology companies that grew along with the Internet. When I first moved there, it was still a rural, almost empty expanse with just a few beachheads of suburbia: a number of residential developments in various stages of construction and a shopping mall that had just opened (before that, the nearest was 40 minutes away). The rest was farmland and empty fields. The cable company didn't even offer Internet access. The 26 months I'd lived there were like the early stages of SimCity, as a few business districts and artificial lakes popped up and a few highways were extended; we even got good sushi. However, this growth was not unchecked. The region is also home to my favorite Thai place. Many longtime residents (e.g., those who had been there since 1985) did not like all these changes. It seemed like every page of the local paper was dedicated to the battles over whether roads should be built and what their speed limits should be, or letters to the editor lamenting the sale of farms to developers or the decrease in the deer population. Both sides seemed to harbor a contempt for the other's culture and values. The local political offices were mostly staffed with the old guard, and I used to wonder what would happen as more and more new residents arrived. Would there be a soccer mom uprising? Would crates of Starbucks coffee be thrown into the artificial lake in protest of the new property tax? As we approached the region from the west, I began to see the results of five years of change. As expected, things were very different. Most significantly, the population had doubled in size. This massive demographic shift did indeed lead to a coup d'etat: As a result of a major campaign, the County Board of Supervisors was wiped clean and loaded with pro-development types. I won't weigh in on whether or not this was a good thing, but I can objectively say that the effect is noticeable everywhere. Almost all of the empty fields are gone; we had to look far and wide to find the first two pictures below. The horse farm I used to drive past on my way to work is now a residential complex. Hil and I got lost in an entire neighborhood that didn't use to exist. Afterward, we put our trip on hold to visit friends and family in Baltimore and Richmond. We had a wonderful time, and would like to thank our hosts for their gracious hospitality. Thanks, hosts! That said, we didn't really do any sightseeing, so let's fast-forward to the Carolinas. 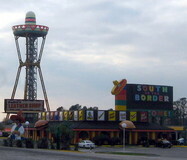 Less than a mile into South Carolina is a place called Pedro's South of the Border that Mike's been talking about as long as I've known him. Apparently when he was a kid, his family used to stop off whenever they drove between New York and Florida. There are countless billboards starting 100 miles away with messages like, "Keep Yelling Kids, They'll Stop!" Mike told me to expect a cheesy and borderline-offensive Mexican-themed roadside attraction, with fluorescent buildings, junk food, a grimy video arcade, and lots and lots of fireworks. How enticing. The whole store reeked of gunpowder. Against my objections, we stopped to see how time had treated Pedro. It was pretty much a waste of time, perhaps due to the time of year. (Oops, I said "time" three times.) Almost everything was closed — we even had trouble finding a bathroom. The giant fireworks store was open for business, though. The clientele consisted mainly of tattooed guys in rude t-shirts. As we were leaving, Mike suggested a round of miniature golf — the course was called Golf of Mexico — but I'd had enough of this place. Writing this entry made me hungry all over again. We didn't eat nearly as much barbecue on this trip as we'd hoped, but before we left Richmond I did a little research and settled on Roger's Bar-B-Q House in Florence, South Carolina. If you ever find yourself on that stretch of I-95, by all means GO! $11 per person buys access to an all-you-can eat buffet featuring perfectly tender ribs, two varieties of pulled pork (we recommend the spicy kind), pork rinds, biscuits, hush puppies, cole slaw, sweet potatoes with pecans, cabbage, greens, and several other items we were too stuffed to sample. Plus angel food cake for dessert, and as many pitchers of sweet tea as you can drink. Roger's more than made up for our disappointment in Memphis. It's made of aluminum. Very high strength to weight ratio. We arrived at my parents' home in Florida just in time to celebrate Festivus. My brother-in-law even supplied a pole. You can buy them on the Internet, but I'm not going to link to the site because they charge 38 bucks. Price-gouging strikes me as very un-Festivus-like; the whole point of the holiday is to reject Christmas hyperconsumerism. I recommend that, in the true spirit of Festivus, you just go down to your local hardware store and buy an ordinary length of pipe. Feats of Strength and the Airing of Grievances are optional. We also celebrated Christmas. Although I'm new to the holiday, it would be unlike me not to have opinions about it, and one of these opinions is that it's repetitive to roast a turkey for Christmas dinner when we all just ate turkey last month for Thanksgiving. Why not feast on something delicious and quintessentially goyish - a glazed ham? The nice thing about cooking ham is that nothing can go wrong. Of course, we found a way to make something go wrong. We knew to get the lower part of the leg, and to make sure it was a city ham (brined and cooked), and to make sure it wasn't pre-sliced, but we failed to realize that our ham had already been skinned. The biggest repercussion was a dramatically shortened cooking time. The first trip to the oven is supposed to bring it to 130°, and the second, 140°. I checked it just two and a half hours into the first cooking and it was already at 150°! I suddenly had visions of Mike's family struggling to choke down tough, dry ham and I nearly cried; this is why I (usually) never cook anything for guests without a practice run. Mike told me to finish the bourbon and to keep my tears out of the ham. We considered our options. There was no time to get a new ham, since the proper recipe can take six hours, and so we concluded that the show must go on. We covered our ham with foil, waited till an hour before dinner to put it back, and crossed our fingers. It was a success! Apparently ham can take a lot of abuse, and we ended up with juicy, succulent meat covered in a rich, delicious glaze. Even the kids went back for seconds and thirds, and children never lie about what they like. We limited their intake of an extra-boozy sauce Mike had made with the pan drippings, but they nevertheless seemed to sleep especially soundly that night. Also, we finally got our pie. No more Quaker Oats shadow. I hadn't cut my hair since last December (that's twelve months ago, in case you've lost track). After that one, Hilary had said, "You don't always have to get it cut so short," which I interpreted as, "You shouldn't ever get another haircut for the rest of your life." I had never gone more than a month or two without one, because my hair turns into a sort of cross between Foxxy Cleopatra and Jay Leno. This time, I was determined to get past that phase, even if it meant using what the metrosexuals call "product." Product did indeed keep the poofiness in check: By around April, my hair finally turned around and, for the first time in my life, started growing toward the ground. My plan had worked! I felt like Columbus must've in 1492. Around this time, Hilary started saying things like, "Although I'm not asking you to cut it short again, you really ought to get it cleaned up." I would have none of this, pointing out that it was now a scientific experiment, and besides, I wasn't going to let her renege on the time she told me never to get another haircut for the rest of my life. The point where I started to reconsider was in July, when we went scuba diving. As soon as I hit the water, my bangs turned into a sort of hair cloud that kept floating in front of my mask. I spent the entire dive brushing them away. I was even wearing a hood, and it didn't help one bit. We have a lot of diving coming up on this trip, and today was my last chance for an American haircut. If my bangs reached the back of my head, I could just hold them in a ponytail (and risk my father taking me out of his will), but they were still a few inches short. There's no way I'm going diving with a topknot, so it was time to end the Great Hair Experiment of 2007. It's not so bad. A little more Latino than I'm used to, but that might be good considering where we're heading. We have a waterproof housing that fits around our camera. Before we take it diving, we wanted to try it out in the pool. The results were impressive: The seal worked perfectly, the controls were easy to use, and the colors turned out much brighter than we'd anticipated. I only hope it works as well in the deeper, darker waters that are to come. We're gonna miss this country. After Christmas, we returned our car in Miami (N.B. : the airport Days Inn is a dump) and boarded the morning flight to Costa Rica. It will be a long time before we return.